A horseshoe wedding ring may be the perfect ring choice for you if you believe that upturned horseshoes bring good luck. Of course, you don't have to believe in superstitions to love the elegance of style and design found in horseshoe wedding bands. A horseshoe wedding band design is also a good choice for anyone that loves horses or wants to have a country and western theme wedding. 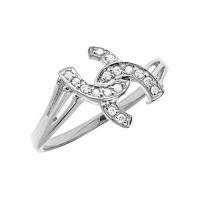 There are many styles of wedding bands that incorporate a horseshoe into the design of the ring. This is achieved by using a horseshoe shape in the mounting of the ring or by using diamonds or other precious gemstones in a horseshoe design on the ring. A dazzling horseshoe of diamonds set upon a band of gold with alternating small horseshoes completely encircling the ring. In the center of the large diamond horseshoe is a larger diamond solitaire. A spectacular band of yellow or white gold completely circled by alternating horseshoes. In the center of each horseshoe is an individual diamond. An elegant golden wedding band completely encircled by raised alternating horseshoes. A single large solitaire diamond can be added to this dazzling equestrian wedding ring. Danny's Jewelry features jewelry pieces that are made by Danny Conley, a well known jewelry artisan. Mr. Conley crafts jewelry that is one of a kind and exquisite. 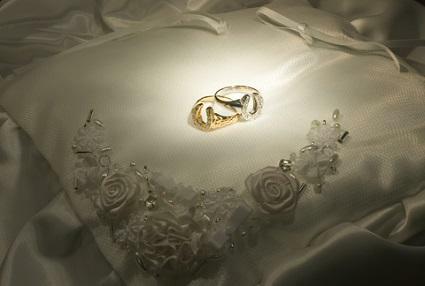 He will custom create men's and women's horseshoe wedding rings to his customer's individual specifications. Shepler's offers several horseshoe design wedding bands in their extensive selection of Western style items. All of the rings that are offered by Shepler's are handmade by Native American jewelry artists making each a unique piece. An elegant turquoise horseshoe wedding band is one of their offerings. This ring would be appropriate for either a man or a woman and is available in sizes 5 to 12. Many couples choose this equestrian inspired style so that they can have matching horseshoe rings for their wedding. The ring is a sleek sterling silver band in a horseshoe stylized design that is set with chips of rich inlaid blue turquoise. Another horseshoe wedding ring offered by Shepler's has a detailed horse head that is framed by horseshoes. The horseshoes are inset with blue turquoise chips making this ring an outstanding choice for a Western wedding. The band is crafted from beautiful sterling silver and is available in men and women's sizes from 5 to 12. Shepler's also offer an elegant sterling silver wedding band that has stylized black horseshoe details. Available in sizes 5 to 12, this stylish wedding band is a perfect choice for both men and women. Wedding bands with horseshoe designs have been popular throughout the years. There are many dazzling antique and vintage wedding rings with this design that are available from jewelry stores, antique shops and auction sites. One of the most simple-yet-beautiful of these rings is this elegant vintage horseshoe-shaped wedding band. Priced around $1,300, this ring has milgrain edging and 18 brilliant-cut diamonds. The setting is available in rose, yellow or white gold as well as platinum. If you love the idea of a horseshoe wedding ring, there is sure to be a style and design that will fit your taste and your budget.